I liked your ride. I’ve ridden on a few WMAs in Georgia, but we don’t have the kind of hills you’ve got up there. The few articles I’ve read so far have been very informative and entertaining, keep it up! Thanks for the kind words. Yes, we have no shortage of hills! TOM & STAN, I HAVE JUST READ ABOUT SEVERAL OF YOUR OUTINGS ON ELK. 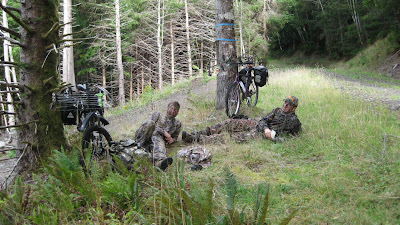 YOU ARE AWARE OF OUR INVOLVEMENT OVER THE YEARS WITH ELK AND HAVE EVEN SHARED SOME SPECIAL TIMES TOGETHER. THERE IS NO QUESTION IN MY MIND THAT YOU AND STAN ARE HEAD & SHOULDERS ABOVE ANY ONE I HAVE EVER KNOWN AS PARTNERS AND ELK HUNTERS. THANKS FOR YOUR FRIENDSHIP THROUGHOUT THE YEARS. I SAY THIS NOW BECAUSE IT’S HOW I HAVE FELT FOR THE LAST 2.5 DECADES AND BECAUSE I JUST TURNED 70 AND I FEEL THAT MY HEART WILL ALWAYS BE IN THE FIELD BUT THAT MY HUNTIN’ DAYS MAY JUST BE NUMBERED…. STAN & TOM , MAY GOD RICHLY BLESS THE BOTH OF YOU!!!! Thanks Brandon, glad you found it useful.